Fiji Water Girl is a phrase which unexpectedly stole the show at the 2019 Golden Globes. Trending on Twitter shortly after the stars walked down the red carpet, as well as being turned into a meme, a model holding a tray of Fiji Water continuously photobombed the famous faces. Throughout the night people questioned whether her presence was a coincidence or a PR stunt. Dubbed as the ‘most obvious PR stunt ever’ and even ‘slammed’ by actress Jamie Lee Curtis, who actively avoided the Fiji Water Girl, you could say Fiji Water may have wanted to be a little bit more creative and tactical. However, with numerous news articles written and brand exposure worth over £9 million, do Fiji Water really care about being subtle? Subtlety and PR stunts aren’t often paired together, and Fiji Water aren’t the only ones to hijack an event. 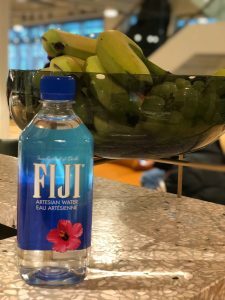 In 2018, Huawei one-upped Fiji Water by hijacking competitor Apple’s launch. As committed Apple fans camped outside Apple’s Singapore store, eagerly awaiting the new iPhone, Huawei handed out battery packs with the message “Here’s a power bank, you’ll need it.” Cleverly playing on, or as some called it ‘trolling’, Apple’s non-existent battery life. In September 2017, O2 promoted it’s new free screen replacements with ‘broken’ billboards in London and Liverpool as part of it’s ‘More for You’ campaign. To make them look as authentic as possible the billboards were surrounded with safety barriers, giving the appearance of an ‘accident’ that was yet to be fixed. Although some were able to see through O2’s tactics, others fell for the stunt claiming ‘You’d never get it past health and safety…’, leading to multiple debates on Twitter. O2’s social media team even got involved, somewhat confirming the PR stunt and the broken billboards were no accident. Following many, many debates and some concerned citizens even reporting the ‘broken’ billboards to contractors, O2’s PR stunt was a success, driving 170K upgrades and £17m in revenue. Last August, cybersecurity reporter Zack Whittaker stumbled upon a hidden job advert for an engineer in Apple’s site source code. The advert said “Hey there! You found us”, and explained they were looking for “a talented engineer to develop a critical infrastructure component”. After Zack unexpectedly found the job advert he did not apply for the job himself. However, he did share a screenshot of the job advert on Twitter. Many others jumped on the bandwagon, starting a flurry of conversation and no doubt sending a bunch of eager engineers to Apple’s site. Now, although Apple weren’t the only ones to pull off this stunt, Flickr and the Guardian have also used this trick to attract new talent, it lead to numerous pieces of coverage in top tier publications, including The Telegraph, BBC and ITV. Zack even wrote an article about how he found the job advert on ZDNet. In November 2017, Uber announced it would be giving away 36,000 doughnuts in London to celebrate Krispy Kreme joining the food delivery app. Yet, as hungry Londoners opened the app to take advantage of the give away the app crashed. Leading now ‘hangry’ Londonders to share their frustration on Twitter. Following #UberEats trending on Twitter as more and more people vented, the technology giants rival, Deliveroo, saw the perfect opportunity to hijack Uber’s failed PR stunt. Working quickly Deliveroo teamed up with Doughnut Time and Crosstown Doughnuts to offer let down UberEats customers free doughnuts central London tube stations the same evening. Rubbing salt in the Twitter wound Deliveroo tweeted it’s offer. The PR stunt hijack paid off well for Deliveroo as many customers tweeted a change in alliance, as well as being praised in many news articles in the Metro and The Sun. O2, Apple and Deliveroo are only a handful of technology companies who have executed successful PR stunts. Highlighting PR stunts are not only for the Hollywood elite, or even limited to ‘glamourous’ brands such as Fiji Water. Technology giants have been using PR stunts to drive millions in revenue for years, especially when hijacking or ‘trolling’ the competition – they seem to be particularly good in that case.